When the St. Louis City Planning & Urban Design Agency’s Planning Commission meets to consider rezoning, it looks like this: ACTION ITEMS: Zoning: PDA-070-16-REZ – 1315-39 S. Grand Blvd. & 3632 Rutger St. (CB 2178), 3656 Hickory St. (CB 2181.06) & 1101 & 1121-27 S. Grand Blvd. 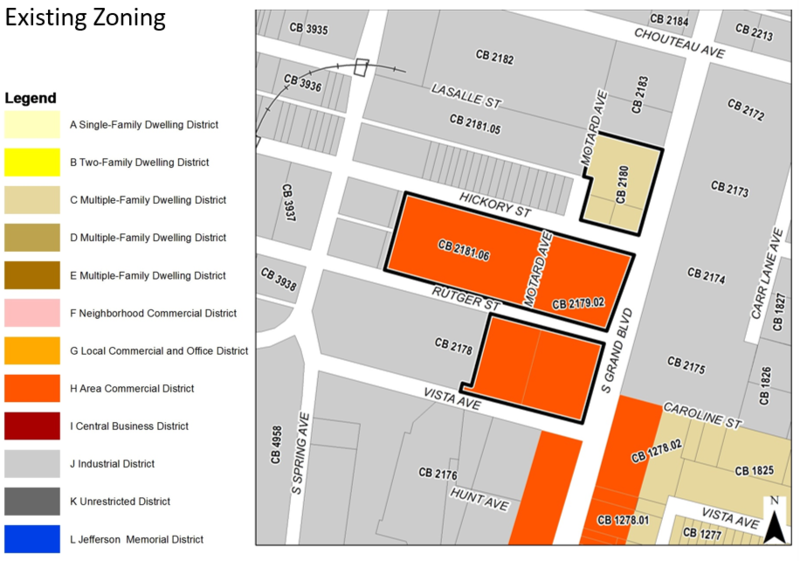 & 1126 Motard Ave. (CB 2180) – Rezone “H” or “C” to “J” – Tiffany Neighborhood. That’s pretty exciting stuff. Area commercial and multi-family residential is being changed to industrial zoning! 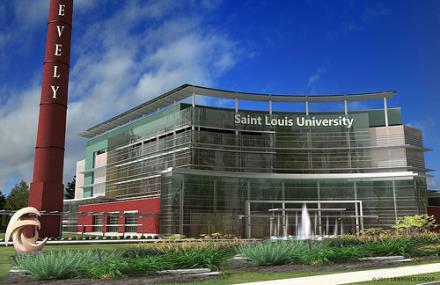 So it’s just one more step toward the realization of the SSM-Saint Louis University hospital, but the new $550M hospital facility will transform this corner of St. Louis City. 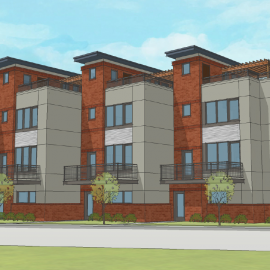 And a little more than re-zoning was revealed at last night’s Planning Commission meeting. A representative of SSM Health stated that while no decision has been finalized, it is “highly likely” that 15-story French Gothic Revival Desloge tower will be converted to office space. This is another step toward alleviating fears that the historic landmark could be lost. 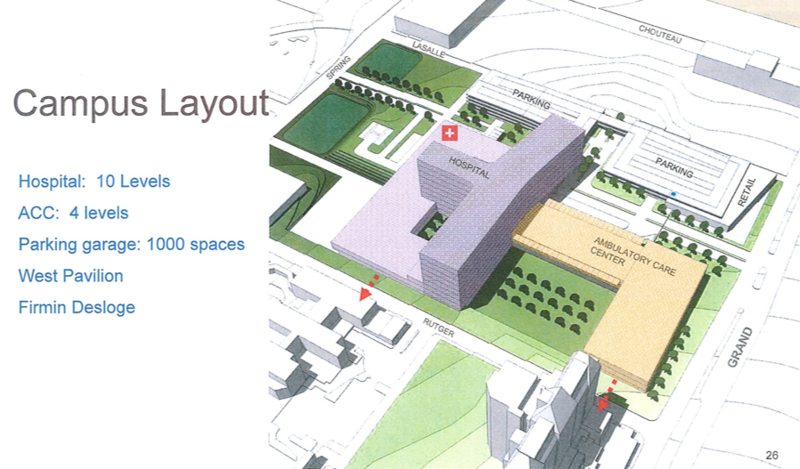 The site plan offered is the same we reported in June, though a three-dimensional image adds some detail. 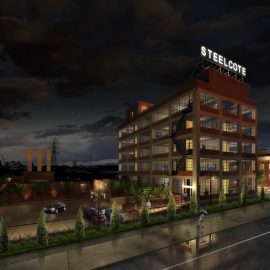 The project is being designed by The Lawrence Group of St. Louis in partnership with Hammel, Green and Abrahamson (HGA). 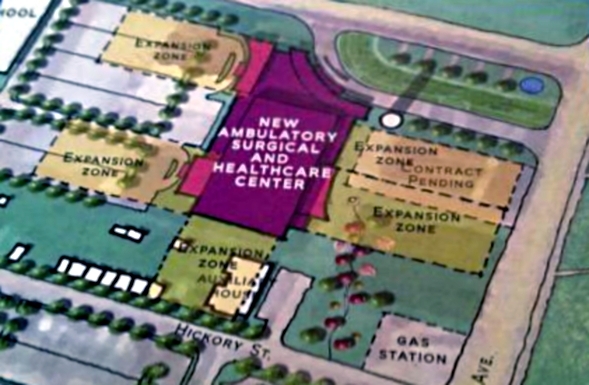 Current plans call for a 10-story T-shape hospital tower, with a four-story ambulatory care center extending east and fronting Grand Boulevard. 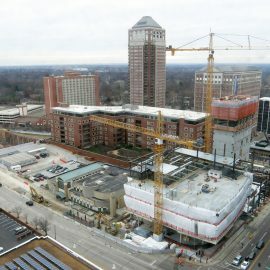 A “West Pavilion” and helipads sit to the west. To the north, Hickory Street would be vacated, and a new Lasalle Street introduced. 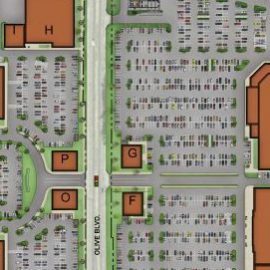 A two-part, 1,000-space parking garage would abut Lasalle, with retail shown wrapping the east end and south edge. In June we learned that the hospital is planned to include 316-beds and total 802K sf and is scheduled to be completed in 2020. 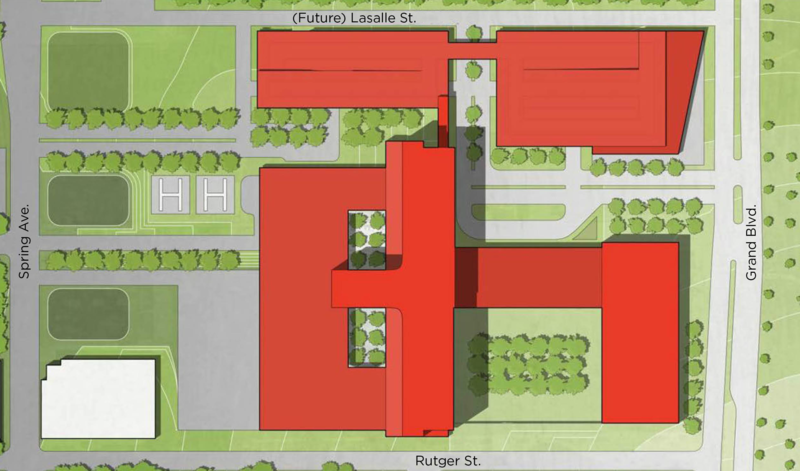 The image is a massing plan and no architectural detail is present. The re-zoning decision does not address the site plan or massing. The image does show the remaining Pevely building still standing at the corner of Chouteau and Grand. While we have heard rumors that the building is being examined for possible redevelopment, its presence is not indicitive of anything in particular. 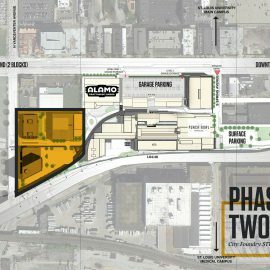 The fate of the land north of the existing hospital and Chouteau Avenue, and even further north, has been highly anticipated since the university’s purchase and request for demolition of the Pevely Dairy complex in 2011. Ultimately, the school was allowed to demolish the majority of the complex, leaving just the corner building. Virtually nothing has changed on the site since then.